Maria works in a production company that brings famous musical acts to Greece. 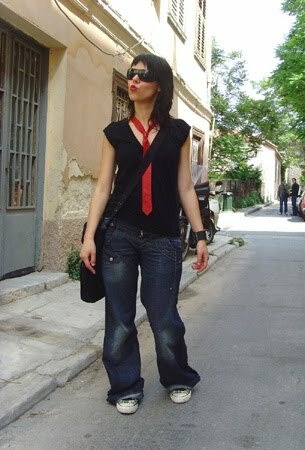 She combines a punk attitude, a skinny red tie and some serious red lipstick giving out a girly rock&roll vibe. Natasha works at the Breeder Gallery, a place that features some the hottest artists, located in downtown Athens. 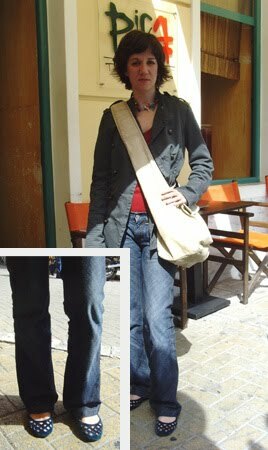 She sports a comfy, laid back outfit, injecting a flirty note with these ballerina flats. Note the special air-conditioning system perfect for our hot Athens days. I just started a new blog on Street Fashion in Paris a little similar to yours. The red lips, red tie, and black tee and shades are rockin!